That little stinkin' leprechaun! He came again this morning. Why on earth does he have to come first thing in the morning? Really? Those peeps are WILD all day long. And....don't even ask me how many necklaces I took away (made them put in their backpack) because they were swinging those things around, placing them over their ears and in their mouth, or trying to choke themselves. They were not the easiest thing I've ever done. I'll be honest....some look more like tie-dyed instead of rainbow! :) The kids won't mind! They are only worried about the taste! I can't wait to see some pics from the party on Friday. 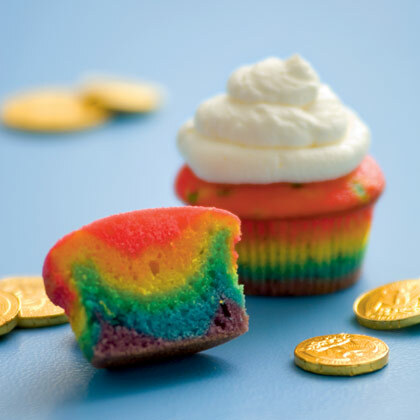 I have been wanting to make some rainbow cupcakes as well but I have been afraid because my creations never turn out anything like the beautiful ones on Pinterest that seem so simple and perfect!